If you haven’t tried tsoureki (Greek Easter bread) before, then you are certainly missing out! Soft, fluffy, with a beautiful brown semi-soft crust and an amazing stringy texture.. This is the most flavourful tsoureki recipe you will ever try! Greek Easter bread owes its full and rich flavour to the two aromatic spices used in this traditional tsoureki recipe, mastic and mahlab, which give a really characteristic flavour and smell. Once put in the oven, the intense aromas of the sweet spices permeates the house and brings back childhood memories. Freshly ground mastic (masticha), which is an aromatic spice from Chios island, and aromatic mahlab or mahleb (mahlepi), a spice made from ground seeds of cherry, are essential to prepare this tsoureki recipe, giving the traditional Greek Easter bread its sharp and distinctive taste. (You can purchase mastic and mahlepi at Greek grocers or online. I have included some links in the ingredients section below). Greek Easter bread (tsoureki) is traditionally served in Easter and the three braids symbolise for the Holy Trinity, but it is also very popular throughout the year as a delicious mid day snack, breakfast or tea or coffee companion. It is a common secret, that making your own Greek Easter bread (tsoureki) is quite challenging even for the experienced cooks. But experience has shown me, that it’s all about having the right recipe. This is a no-fail tsoureki recipe (with all the prep photos) for you to succeed on your first time! Tsoureki dough is all about the rising, which means that the right temperature is key. Once starting to prepare this tsoureki recipe, make sure that all ingredients are at room temperature before using and lukewarm when added in the mixture; this will guarantee that your dough will rise. Give the dough time to rise and it will reward you with its distinctive air-y fluffiness. For this tsoureki recipe, make sure to use bread flour, which has elastic toughness that holds its shape well once baked. The most common mistake for the ones that haven’t tried a tsoureki recipe before is that once the dough is mixed, it resembles a little sticky, so most just add more flour, which result Greek Easter bread to lose its fluffiness. So be careful to add more flour than this tsoureki recipe calls for only in case the dough is very sticky after mixing for 15 minutes. Garnish Greek Easter bread with syrup for extra moistness and almond silvers. Oh and you can always read this in Greek if you fancy Συνταγή για αφράτο πασχαλινό τσουρέκι με ίνες! Enjoy! To prepare this tsoureki recipe (Greek Easter Bread), add in a bowl the lukewarm water, a pinch of sugar and yeast and stir. Wrap well with plastic wrap and set aside for about 6-7 minutes, until the yeast rises and starts bubbling. Be careful not do add hot water, as it will kill the yeast, nor cold, as it will take forever for the Greek Easter bread to rise. The water should be at the same temperature as your finger, so check it out sticking one finger in; you should feel no difference in temperature. In a saucepan add the butter, sugar and milk. Place over very low heat and stir the mixture, until the butter has melted and the sugar has dissolved. The key is to melt the butter at very low heat, so that the temperature doesn’t ‘kill’ the yeast. Remove the pan from the stove and check the temperature. The mixture should be at the same temperature as your finger. If it is warmer, leave to cool down for a few minutes and check again. Pour the butter mixture in a large bowl and whisk in the eggs. Add the yeast mixture and whisk to combine. In the mixer’s bowl add the flour, the ground mastic and mahlepi, orange zest and the butter-egg-yeast mixture from step 4. Using the dough hook mix at first at low speed, until the ingredients start to combine and then mix at medium-high speed for about 15 minutes, until the dough doesn’t stick on the sides of the bowl. At this point the dough should be really soft, like seen in the picture and a little sticky. (Be careful not to add any more flour than this tsoureki recipe calls for, as the dough should be really soft and not firm). Cover the dough with plastic wrap and place in a warm environment, until at least it doubles it’s size (for about 2-3 hours). If the environment is cold, preheat the oven at 30C, turn it off and place the bowl inside. Gently deflate the tsoureki dough with your hands and cut in 6 equal portions (three for each Greek Easter bread). Take one piece of the dough (do not flour the working surface!) and roll it a little bit with your hands. Hold with your hands from the edges and shake to stretch the dough into a rope. This technique will help the Greek Easter bread (tsoureki) form the characteristic stringy texture, as seen in the picture. Form the Greek Easter bread into a braid and transfer on a large baking tray layered with parchment paper. Repeat the same procedure with the second tsoureki. Let the Greek Easter bread rise for about 1 more hour at room temperature or in the oven, until it almost doubles it’s size, like seen in the picture. In a small bowl add the egg and 1 tbsp water and whisk with a fork. Brush the top of each Greek Easter bread with the egg, being careful not to deflate it, garnish with almond silvers and bake in preheated oven at 160C for about 30-40 minutes, until nicely browned and fluffy. Although the traditional tsoureki recipe doesn’t call for syrup, garnishing Greek Easter bread with just a little syrup, always gives a little something! So it’s up to you to decide! Prepare the syrup for the Greek Easter bread just right before you turn the tsoureki out of the oven. In a small pot add the sugar and water and bring to the boil. As soon as the sugar dissolves, remove the pot from the stove and ladle the hot syrup over the hot tsoureki. Let the Greek Easter bread cool down and wrap well with plastic wrap, so that it doesn’t become hard and dry. Store for up to a 5-7 days at room temperature. Prepare this traditional tsoureki recipe for your friends and family and enjoy over a hot cup of tea or coffee. 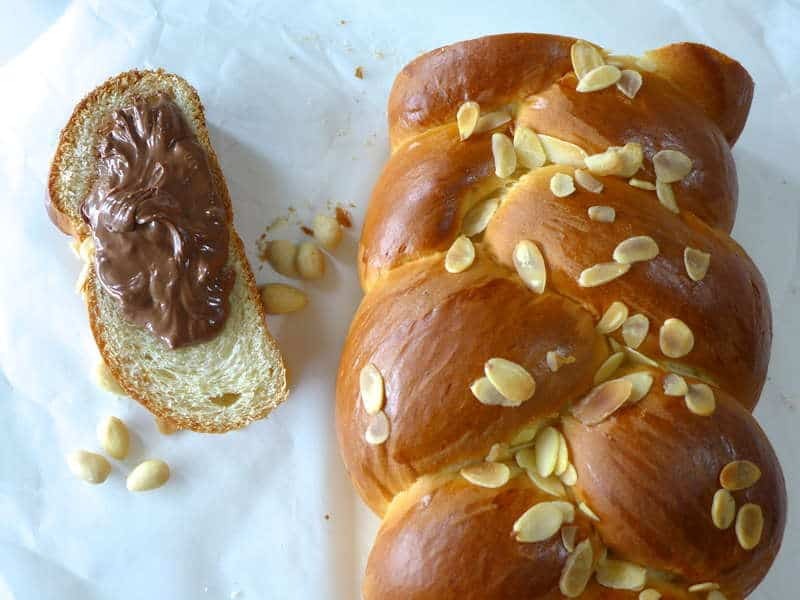 If you like an extra something in your tsoureki, try adding some Nutella in the braids! When you have stretched the braids out, flatten them with a rolling pin, add a thin strip of Nutella and fold them back into shape. Then proceed with braiding. Oh my goodness, oh my goodness….they look divine! I have a recipe very similar and when I have made it in the past I was always a little confused why some worked out and others not. Your explanations are wonderful and now I know what I have to look out for when making it. Easter – here I come!!! η ζυμη με αυτες τις αναλογιες κολουσε στη λεκανη του μιξερ. Επισης βρηκα καπως δυσκολες τις οδηγιες με τα μετρα οπως δινονται. Χρειασθηκε να ζυγιζω τα υλικα στη μικρη ζυγαρια. Thank you so much! It’s my favorite tsoureki recipe and the kids always end up wanting more 🙂 So glad you liked it! I would like to make this recipe, I remember my godmother use to make it all the time. It was my favourite. However, I have a slight issue. I am allergic to dairy products. Can I use almond or coconut milk instead of regular milk? Also can I use coconut oil instead of the butter? I have not tried making it using coconut oil or milk substitutes. However I believe that soya milk might be better suited. Coconut oil should be ok as long as you like coconut flavour 🙂 Let me know how it goes, I’m keen to give it a go myself! I can’t use soya milk, I am allergic to it. I’ve used coconut oil with many recipes, and they turn out great. Soon I’ll try the recipe. When I do, I’ll let you know how it went. Thanks! Ah I see… 🙁 Hope it turns out amazing and looking forward to your feedback! I’veused coconut milk as a substitute in other breads. If you use the carton and make sure it’s unsweetened it doesn’t have that much coconut flavor overpowering things. I noticed the recipe has no salt. I presume you are using salted butter, so I added 1tsp salt with the unsalted butter. The recipe is nice, but the process pictures were especially useful since different mixers need different times to get to the right knead. My Kitchenaide 7qt needed only 12-13 min. I was worried about over kneading, but your picture assured me I got it right. Thanks for a lovely recipe that I will share on Western Easter with my Wife’s Church and Orthodox Easter a week later for us. This will be the second time I have made tsoureki and I am very excited to try this one out! Based on this recipe, is there any tips that need to be said? Anything I have to be careful of? 1. Double rise – let the dough rise once in the bowl and second time when they have been formed into a braid. That will make them extra fluffy and airy! 2. The syrup – I personally love my tsoureki sweet. So I always garnish it with some syrup to give it that extra bit of deliciousness. Dont worry, it wont get soggy, but it will have a delicious glaze around it! 4. Make sure the temperature of your room / oven is correct for proofing – not too hot but not too cold. It needs to be about 37C which is roughly body temperature. Your welcome Connie! Happy Easter to you too! Yeap, flatten them out before braiding, add the nutella and roll into long strings, I’ve added a “how to” at the bottom of the recipe..
a few questions – is there any reason that you do not knead dough after it rises in the bowl? Also, is bread dough good to use or not? As for yeast i will be using wet /fresh yeast (not dry in packets). Do you have a measurement for that. One piece of the wet yeast is equal to 3 packets (that is what the wrapper of fresh yeast says. I dont knead a second time as I want to keep as much of the air inside as possible. Just gently deflate and form into the strings and braid. Hm, fresh yeast is a difficult beast 🙂 It really depends on the yeast’s strenght and I find that it gives a slightly different flavour as well. A handy conversion is to multiply dry yeast weight by 3 when going for fresh yeast, so you will need ~60 grams of fresh yeast. Hi Eli. Can I use 1% milk ? Eli, your recipe looks wonderful!. For years I have tried to make it from recipe of an elderly Aunt, but never had great results. Today I made it again using your recipe and am waiting now for the dough to proof. It is exactly as you describe and I am looking forward to bring it to completion. By the way, all of the recipes of yours that I have seen on here look excellent. Most are very similar to the way my family prepares the food. They are from the Kalamata region of Greece. May I ask what are you are from? Hi. I made this for the first time today, although I have made Swiss zoph before which is a bit similar. I don’t have a mixer with a dough attachment but I do have a bread maker so I put the dough on the dough setting for about 30 minutes. I was really pleased with how light the bread came out. Unfortunately where I live (small country town in Australia) mastic is just too expensive and difficult to get but I ordered mahlepi online and love the smell of it. Since I can’t get the mastic should I increase the amount of mahlepi? I didn’t read the instructions well about making two loaves so made one really big loaf. Yikes, the dough is so stiff that I burned out (stripped the gears) of TWO Kitchenaid mixers in a row. I weigh everything in grams and double check each time. My thought would be to reduce the flour or increase the water to get a looser dough. Any suggestions? Im a bit confused – does this ‘bakers bowl’ consist of an electric whisk? how do i combine the ingredients together? Hi I cant get Mastic or Mahleb in Singapore. Are there substitutes? can someone please give the measurements in cups spoons and oz. Hi, is there a video for this recipe yet ??? I do not put mastic in my tsourekia, just the mahlep. Mother’s recipe from the island of Lesbos, did not use. Personally I love the aroma of mastic so I prefer the tsourekia with it 🙂 But of course you can skip it if you want to. Interesting everyone found flour ok.
My dough was far too sticky to do anything with it so ended up adding about a cup of extra flour! For some reason, the top and side crusts of my tsourekia end up being hard, not soft like they should be. The bottom, however, does stay soft. Do you know what I could be doing wrong? Thank you for this recipe. I was just wondering which oven shelf level I should be baking the tsoureki on? I tried making the tsoureki and it rose but also spread sideways a lot and was a lot more flat looking than your photos. Should I be putting it into a tin instead or is there something else that am I doing wrong? Hi Eli, I always make my brioche this way and it always turns out fluffy and airy. My friend’s mother gave me a recipe similar to yours once and I have been making it for many years even though I am not Greek, I love this treat a Easter.She told me I made a mean tsoureki which was quite a compliment from a Greek lady who had made it all her life. Hi! I accidentally purchased the Mastic in its gum form. Am I still able to use it or should I take it out of the recipe?